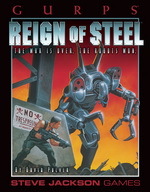 GURPS Reign of Steel: Will to Live – Augment the original Reign of Steel supplement with this GURPS Fourth Edition update. Pyramid #3/71: Spaceships II – Features "Reign of Steel: Deep Space," David L. Pulver's GURPS Fourth Edition expansion of the setting's timeline and history that takes the fight against the robots into the void! GURPS Y2K – Now that it's just fantasy, visit the world that might have been . . . the world where everything went wrong. The Big Crash. The Bug. The end of technology – the end of humanity.